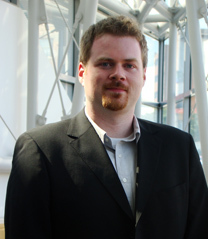 Former ISR postdoctoral researcher Matthew McCarthy has received an NSF CAREER Award for Investigation of Boiling Heat Transfer Mechanisms and their Enhancement using Biotemplated Nanostructures. McCarthy is an assistant professor in the Mechanical Engineering & Mechanics Department at Drexel University in Philadelphia, where he directs the Multiscale Thermofluidics Laboratory. He is a former postdoctoral researcher of ISR Director Reza Ghodssi (ECE/ISR). The five-year, $500,000 grant will sponsor research that leverages the simplicity and flexibility of biotemplated nanofabrication to investigate fundamental mechanisms by which nanostructured coatings affect liquid-to-vapor phase change during boiling. This will be accomplished using the self-assembly and metallization of the Tobacco mosaic virus (TMV) to fabricate tunable surface structures for novel and probative thermofluidic characterizations, leading to the realization of high-performance surfaces with heterogeneous architectures. Critical morphological and material properties will be tuned with unprecedented control, allowing systematic experimental characterizations, direct correlations to boiling phenomena, and the determination of new mechanistic models. Advanced imaging techniques based on IR thermometry and confocal scanning laser microscopy will permit simultaneous visualization and measurement of the wetting state, surface temperature, and local dynamic heat flux during boiling/evaporation. These measurements will be made possible due to the compatibility of biotemplating with low-conductivity and low-melting temperature polymeric materials. Lastly, novel surfaces with complex and heterogonous architectures (made possible via biotemplating) will be engineered for enhanced performance across all stages of boiling. These include surfaces with in-plane variations in materials and thermal conductivity, combined with superhydrophilic nanostructures.